Budgets for community projects like the Canyonlands Care Center in Moab, Utah, could take a hit if the Senate votes to strike down the Bureau of Land Management's methane and waste prevention rule. Photo courtesy of the Canyonlands Care Center. If the Senate votes to repeal the Bureau of Land Management's Methane and Waste Prevention Rule, states, tribes and federal taxpayers could lose out on millions of dollars in annual revenue that goes to support social services, higher education and other needs, local officials say. In Moab, Utah, a senior care facility hangs in the balance. 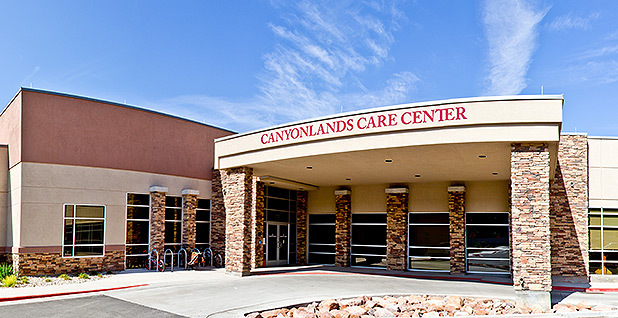 The 36-bed Canyonlands Care Center receives two-thirds of its funding from Medicaid and one-third from private pay. But even at 90 percent occupancy, the facility's finances still fell short. Mineral leasing dollars helped fill the gap for a time, but the oil bust dried up that revenue stream, prompting a successful appeal for the support of a new Grand County sales tax. "You can't rely on oil and gas revenues, and we learned that last year," said Kim Macfarlane, the home's administrator. But rolling back BLM's rule would deal a fatal blow to the care center's operations, she said. Collections on fossil fuels captured on public lands provide critical support to the facility's budget, and BLM's regulation helps ensure that natural gas withdrawn from federal tracts flows to the marketplace — not the atmosphere, Macfarlane said. "If the rule were to disappear, then we'd have to close the doors," she said. Shutting down or limiting the care center's capacity would have a devastating effect on the community, Macfarlane said. The next closest facility is a 2.5-hour drive away. "If your mom needed to be placed in a care unit, imagine having to go two hours to see her," she said. "It's just not good for anybody." "Any reduction in federal leasing revenue certainly puts a lot of stress on local governments and creates the potential to have to raise property taxes," Baird said. "It's a big issue." The potential environmental implications of rolling back the BLM rule also have financial ramifications, Baird said. Nestled between the Arches and Canyonlands national parks, Moab — population 5,200 — has a robust recreation economy. Its red rocks and blue skies draw more than 1 million visitors to the tiny city each year, according to Moab's website. "We sell views," Baird said. "When you sell views, air quality is a big part of your economy." In New Mexico, budget woes have sent many of the state's services into a spiral. Public universities have discussed laying off staff members and shifting tuition costs back to families. The state's courts have proposed halting jury trials due to a lack of funding. "It really is a common-sense solution. I think it's one of those no-brainers," said James Jimenez, executive director of New Mexico Voices for Children. "Here we're taking an asset that is finite in nature, and we're basically throwing it away in ways that fiscally and from a health perspective don't make sense. It's profit-oriented at the expense of our health." He cautioned that BLM's regulation is not a silver bullet. "Capturing the methane won't be the sole solution to our budget problems, but it's one of the things that helps," Jimenez said. New Mexico's Republican governor holds the opposite view. "Absent a repeal, funding for New Mexico's schools, roads and healthcare will be dramatically reduced on account of the reduction in revenue generated by the oil and gas industry," Susana Martinez wrote in a Jan. 27 letter to House Speaker Paul Ryan (R-Wis.). If BLM's rule is allowed to stand, she said, new oil and gas development on federal lands will stagnate, reducing royalties paid to state and federal governments. The BLM rule's budgetary impact hinges on at least two factors: the market value of natural gas and whether industry would respond to the regulation by stopping production. The low end of that range is in line with an industry estimate that BLM's rule would result in a $3.68 million benefit, after taking into consideration the value of gas in the marketplace. In 2008, which served as the reference point for the GAO report, natural gas prices rose to more than $13 per million British thermal units. "Adding in the economic marginal impact of the additional volume in a market landscape with heavy inventories it could easily be assumed that all of that volume may be much lower and could have a marginal value approaching $0," the alliance wrote. Industry interests have also said that the effect of BLM's rule would be to shut in production, resulting in a $114 million drop in tax dollars. "There's no question that shale development has been a lifeline to these communities, but federal mineral development has not kept pace with private mineral development," said Jackie Stewart, Ohio director for Energy in Depth. "In Ohio's Wayne National Forest, it took the BLM five years just to allow leasing of federal minerals."